For the final comic in our holiday season guest creator extravaganza, we were able to lean on a whole wealth of extraordinary talent. Writing was once again provided by Dave McNally, previously seen here. Two of the guest comics were written by Dave, whose work provided not only a relief from writing, but an inspiration for my own, as well. (this means I’m going to steal your ideas, Dave) As I’m sure I mentioned before, Dave’s own tastes lean more towards wargaming, so we get to see things from that perspective in this strip, as he ponders the three great mysteries of wargaming: Where the heck do you put it all, how on earth do you find time to play it all, and how do you even begin to explain your obsession to your partner? If you follow that link you will see why I intend to chase him up for further, and more extensive collaboration for next year’s holiday guest creator extravaganza (otherwise known as myself and Aileen get to take some time off for Christmas). See all of you fine and lovely people next week, for maybe a special Christmas-y post. But only if you are all really lovely and tell us what the best game you played this year was. Not the newest, it doesn’t even have to have been released this year, or last. Simply, what was the most fun you had playing a game. In one sitting, over the whole year, up to you. We would just love to hear about some fun games you all played. This was a year of rediscovering board games for me, as I’d kind of taken a break for a while. Favorites include (but are not limited to) Alchemists, Euphoria, The Manhattan Project, and Between Two Cities. The most awesome thing about this year though is that I got into designing games. I’ve nearly completed two (one of which is currently being reviewed by a publisher) and have ideas for two more that I’m itching to start on “(one of which I began to prototype last night). Playing other designers’ prototypes has been super fun, especially coming up with ways to help them push their designs and make them better. I attended my first convention this fall – Metatopia, which is centered on play testing – and have plans to go to Unpub and Origins in the Spring. I’ve dived head-first into gaming again and am getting a tremendous amount of satisfaction and enjoyment from it. Not sure if that was what you were looking for, but I thought I’d share anyway! Been curious about Manhattan Project for a while, actually, it’s a game I think we’d really enjoy. Good luck with the prototypes! Hi again. 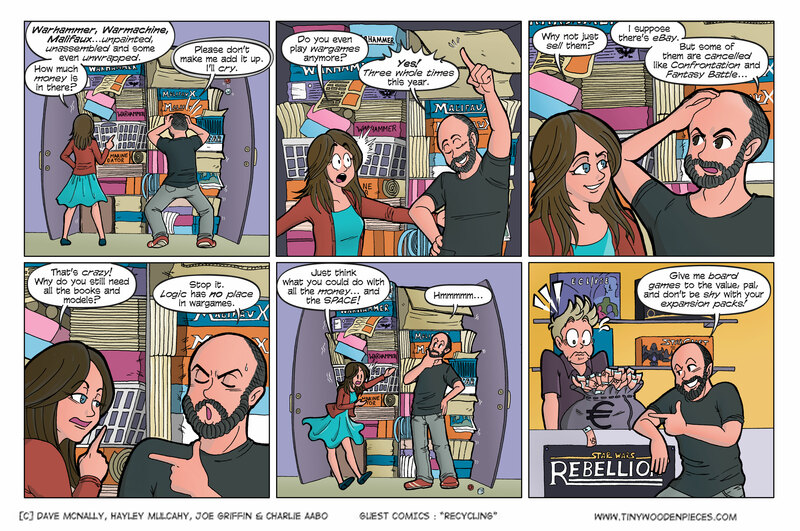 Thanks once more to Aileen and Colin for allowing me to hijack their comic. Joe and Charlie did a great job but a special mention for Hayley as I think she did a wonderful job with quite a limited script. Shameful admission: this cupboard really does exist. Just sending reference photo’s to Hayley was embarrassing enough but once I realised how little I had played this year, how many models weren’t even opened and roughly how much cash was in there… well let’s just say I haven’t bought any models for a while. Although thanks to tinywoodenpieces I have begun amassing board games. Unfortunately without the middle step of selling the models. I think I may have to add a “hobby wing” to our house. Please tell me I’m not the only one with this affliction. Hey look! We even managed to fit in Star Wars. Happy Star Wars week everyone! Colin has a curly beard in this one 🙂 For me probably it was a game of Small World with 5 colleagues (two of them playing it for the first time). Or a game of Saboteur with, let me count, 8 players (5 of them women from another department we have invited, who haven’t played anything like that) with lots of hysterical laughs, confusing backstabbing, clever bluffing. Or that nasty game of Shadows over Camelot which i have already mentioned, which turned into a loss after we have won 🙂 Playing Ticket to Ride 10th anniversary version was fun also. Hysterical laughs make for the best games. Or rather, the best games make for hysterical laughs? One of those. For us, both Robo Rally and Monikers always ends with, or includes hysterical laughter at several points. There’s really no better review of a game, and those are the games that I remember the most. A few of both of those this year for us. Thanks for replying, and I hope you have time over the holidays for gaming. Hi! Hayley here. I’d like to thank Colin so much for approaching me to do this. It was really fun, and it was so cool getting to see Dave’s cupboard! 😀 It’s awesome seeing the whole comic brought to life now with the colours and lettering, which Joe and Charlie did a great job respectively. I’ll admit it’s been an age since I played a table-top game, but we got Scattergories to play over Christmas so I greatly look forward to it! I got to play it at work and it was great craic. Thanks for the stellar job, Hayley! I’ve never actually played Scattergories, I must admit. I will investigate.